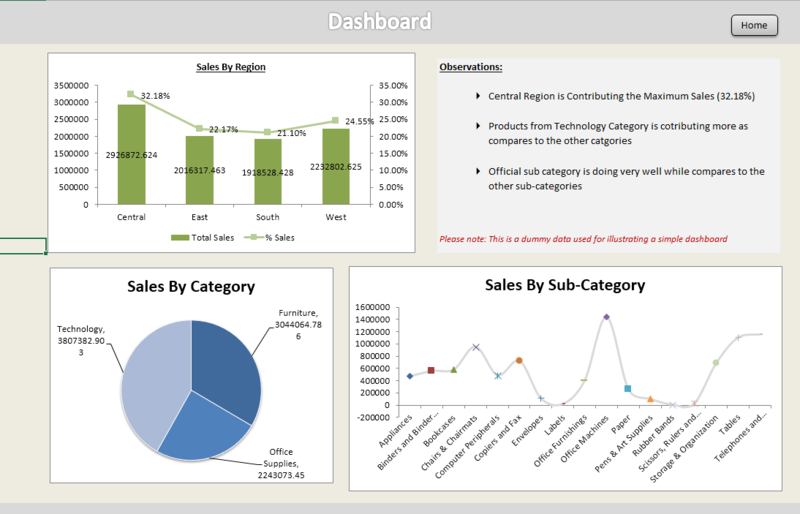 Creating Dashboards in Excel - Dashboard Creation Using Sales Data - ANALYSISTABS - Innovating Awesome Tools for Data Analysis! Creating dashboards in Excel is very easy and you can create dynamic dashboards. This is a simple dashboard, I have used a dummy store data for illustration purpose. You can provide the buttons to Navigate the worksheets: It is good idea to provide buttons or links to navigate the worksheet, it will increase the user experience while using the dashboard. It will be the one place where you can keep all important tables and charts which can give the overall understanding of the dashboard at one glance. You can also include the overall observations in this dashboard. How do you create this awesome dashboard with the tabs? Any step by step tutorial for this? Thanks for your comments, I am working on it and can add step by step tutorials to create dashboards in few weeks. Looking for advanced excel 2013 training as new role at work demands lot of reports and dashboard preparation, presentations and applying logical math’s. We are going to launch the Excel Dashboard course in September 2014, you can join in that course. Any guidelines on how to use the dashboard builder on the add in. can’t seem to pull through data to create a dashboard- not sure if im doing sometihng wrong! I am working on the video tutorials, this will take couple of weeks. It would be really helpful if we can get step by step guide to use the dashboard builder. Right now, I cannot make head or toe of how do I populate the fields after I click on the dashboard builder. First of all thank you so much for sharing this beautiful dashboard. I would be obliged if you teach me how can I add buttons to navigate the worksheets.